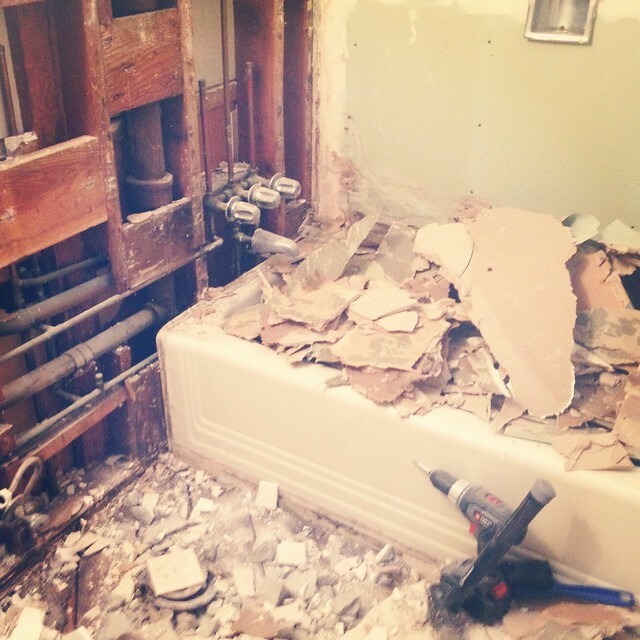 Renovation Speculation: Will My Bathroom Remind You Of Incarceration? While I can think of several things I'd much rather be in the middle of—a two-week trip to Bali, an Evan Dando sandwich—the bathroom renovation is not, so far, proving to be as soul-destroying as I thought it might be. It is not, for instance, as soul-destroying as the kitchen renovation was, though I think this is probably because a bathroom renovation doesn't involve a refrigerator sitting in your living room for six weeks, just a toilet sitting in your garage for three. Mason Jars: For When You're Too Cool to Rent a Portapotty. Our bathroom right now is basically an empty shell. Sean demoed the entire thing last weekend—I think the Yankees had lost, which made wielding a crowbar extremely effective therapy for him—and now we're just waiting to put the pretty parts in. Here's a picture of what it looks like right now, except imagine that pile of rubble in the bath being on the floor of our garage instead, which I know is a stretch since you've never been to our garage, but just think of the most horrifying, disorganized, dusty nightmarish hell a Type-A brain could summon and then multiply that by fifty. Which, coincidentally, is the number of years it's going to take me to not be bothered by it. Or maybe the number of margaritas, same diff. While we did pretty much the entire kitchen reno ourselves, we're wimping out a little bit on the bathroom reno and hiring a professional tiler instead. Yeah, we could probably have attempted it together, but we'd have spent the same amount of money on a marriage counselor halfway through, so at least this way we get to stay married to each other and we don't have to sit on a couch and talk about our feelings. I'm just kidding. I love talking about my feelings. For example, my feelings about this tile are mostly centered on the fact that I want to kiss it on the mouth. So everything's ticking along, and the tiler is all set to start tomorrow, which means we might have a functioning bathroom sometime in the next two weeks. I've figured out what pictures I'm going to put in there, I'm working on hacking a light fixture using some $25 lamps from the Lowe's garden department instead of sacrificing my firstborn child for the "industrial" one I found in a fancy store online, and I even bought a shower curtain on ebay the other day, which still remains just a little creepy-sounding, no matter how many times I re-read the "brand new, never used, in original packaging" line on the listing. All that remains is to figure out what color I'm going to paint the walls, and even though it's a very small room, I'm leaning towards a dark gunmetal gray. I know, I know, it's unconventional for a bathroom—plus it's the color of my bedroom—but I can't help thinking that it could look really handsome. Well, either really handsome or kind of like a prison cell. Should I risk it? i love gray! I bet it would look great. I was thrilled when I moved into my rental house and said "you HAVE to keep the gray walls in the front room." They not only saved that room, but repainted the other rooms in a similar mindset. I don't need ALL my rooms gray, but much better than beige or white. I can live with it until I have the time/motivation/money to do something different. Love the house posts, keep them coming! This is bringing back many bad memories of when we renovated our bathroom (and had no other toilet!). Thankfully that's all behind us now but I'm edging towards repainting it "storm grey" as opposed to the bright turquoise I originally painted it. Looking forward to seeing the end result. EGGPLANT. Paint all the things EGGPLANT! I am so into that color these days. Or, as you would call it, AUBERGINE! You are a brilliant, brilliant woman. My bathroom looked almost exactly like yours just a few short weeks ago, but we (ahem, my husband) decided to do the tiling ourselves. My husband is still cursing me and the very pretty subway tile I chose. Whatever, it looks fabulous. I am also super impressed by your vanity ambitions. No joke -- no one will ever powder their nose in your house again without hearing about it. I merely hacked the base off of our old vanity and replaced it with little turned furniture feet and I still can't stop pointing them out to people; the words just fall out of my mouth involuntarily. And usually include "saw" and "nail gun" and "I DID IT MYSELF!" Can't wait to see the finished job - LOVE the marble! Definately go dark! We have a tiny WC downstairs and painted it Farrow and Ball 'blue black' (or is it 'black blue'..?) Anyway, white tile, dark, dark walls, and white picture frames and white ornate bathroom mirror.. We love it and it works, I think..:) ! Looking forward to seeing the end result! I think you're partly responsible for my love of grey...so of course, I say go for it :). I had an epic battle to find my perfect shower curtain, so I'm excited to see yours! I can't wait to see the DIY vanity and the light hack. And I think the gunmetal gray will look awesome in contrast to all the crisp white in the room. I've been dreaming about tearing apart our bathroom (it's currently old-lady pink hasn't been remodeled since the house was built in the 70s - by an old lady, natch) and painting the walls a medium gray with white subway tiles. I'd bring in lots of pops of yellow. Of course, this won't be happening for another year, so I'll just live vicariously through you. I think grey with all that white tile will be stunning. Can't wait to see it!!! when we gutted our bathroom (the ONLY bathroom) last summer, not only did i shower on our screened porch with a camping shower & tarp, but i spent the two days when we had no toilet going to the bathroom in a 5 gallon bucket lined with a plastic bag full of kitty litter. You haven't lived until you've gone #2 into a bag of kitty litter. Gray for you is not a risk at all. If you want to "risk it" you should go wild and crazy and paint it yellow, or blue. Although, I really do like the eggplant idea, but you're not an eggplant kind of girl, are ya? Eggplant as the commenter above said or a deep, vibrant blue! Ami: Ha! You're right -- most rooms in my house ARE gray (well, with the exception of my office, but that's a dark navy blue.) I'll definitely LIKE the charcoal walls, it's more about whether I'll turn the tiny room into an even tinier room. Your tile choices reminded me of a lovely bathroom done by Alicia at Posy gets Cozy--she said she was inspired by the Empress Hotel in Victoria, BC. She did a blue-ish gray on the walls which looks a bit more country than maybe the look you are going for, but the pictures are still gorgeous. I like someone's suggestion of very dark, something dramatic. I recently visted a bathroom (Well, I mean I visited a friend not just her bathroom) that had dark gray walls and quite liked it. I also like that eggplant suggestion above. Mostly I think whatever you pick will probably be fantasic though and I can't wait to see it! I am in the process of painting our bedroom a lovely dark grey. So, I'll let you know about the whole feeling incarcerated thing. At least it will be with my husband and has mountain views! After seeing Daniel's bathroom makeover, I almost immediately went and bought a quart of Benjamin Moore Nightfall 1596 to paint the walls of my bathroom. Dark grey is the best for bathrooms. Thom took a crowbar and sledgehammer to our master bath months ago. And it was messy and awful. And it's still in shambles. He clearly didn't think this through. We're not very good at real home renovations, just superficial ones apparently. Your bathroom is going to be gorgeous though. I expect nothing less from you. Small bathrooms benefit from dark walls-they tend to seem bigger because the dark color recedes. We repainted our light khaki powder room in a deep shade of red and it was amazing--what had seemed claustrophobic became comfortable! Somehow, the same trick doesn't always work in medium or larger rooms, but the trick is great for teeny ones. Hmm, I think it depends on whether it's going to be ALL gray or just a small portion of it (like the top half of the walls), and whether you have natural light and/or good lighting. Our (rented) bathroom is floor-to-ceiling DARK brown tile, and I hate it. It's tiny to begin with, gets no natural light, and the other fixtures are just a slightly lighter shade of brown, so there's nothing bright to balance it out. Gray can look stunning, but in a small room you definitely need balance! As someone who is seriously considering buying a house that will need a number of updates, I am in awe of your ability to do so much of the work yourselves. My husband and I hung blinds last year; it was the first time either of us had ever wielded a drill and we were inordinately proud of ourselves. So my question for you is how did you guys became so good at it? Did you learn all these skills as adults, or had you had some experience helping out when you were growing up? Are there any particular books (or Home Depot classes) you'd recommend? ps Lurrrve that tile and the gray too. I think the color will look smashing, esp when the bathroom is fully lit. We renovated our bathroom last year and used that tile on the floors, but we went with white subway tile on the shower walls and behind the vanity. The paint, however, is a dark grey - and we love it. Just added a bright shower curtain and art. Totally un-jail like. Can send you a photo if you want. Let's do something interesting on the ceiling. Wallpaper? Or a metallic grasscloth! Or just painted the same color as the walls. We're planning for our basically entire-first-floor reno this summer, including the half bath. I am RIGHT THERE WITH YOU on the vanity situation, sister. WHY are they all SO UGLY? I have a very specific idea in mind, and the only thing I found that fit that is WAY too expensive (like $1500) and too big. I am ordering a custom one from a reclaimed wood place online for less that what we budgeted - whee! Can't wait to see how your place turns out! ooh, love! i think with all of your white-ish tile and hopefully fantastic shower curtain, it won't look all prison. especially if you accent with white towels and a big ol mirror. And I think the wood of the vanity will offset it. We painted our bathroom a light lavendar grey - I had intended more gray gray but then whoops! Oh well, it was a nice surprise. mine guest bath is a dark grey and i love it. it doesn't have a window and it makes it feel cozy and intimate. i just changed the light fixture and added a circular turquoise mirror and it make's me really happy. i say do it! here's the link if you'd like to check it out. Definitely go for the gray! We just painted our smallest bathroom a dark gray--Sherwin Williams Dovetail, which is darker in person than on the Sherwin Williams page. Our bathroom is quite a bit smaller than yours, from what I can tell, and despite my concerns that the dark gray would shrink the space, instead, it has turned out to be the space folks comment on the most. "Love the color!" As we do, it looks like you'll have lots of lighter colors with your sink and tiles, and it will be gorgeous. Yummy. And so easy to accent with just about any brighter color you like. "For example, my feelings about this tile are mostly centered on the fact that I want to kiss it on the mouth." Literally laughed out loud at this one! Count me an anti-gray. How about duck egg blue? It's in the turquoise family. 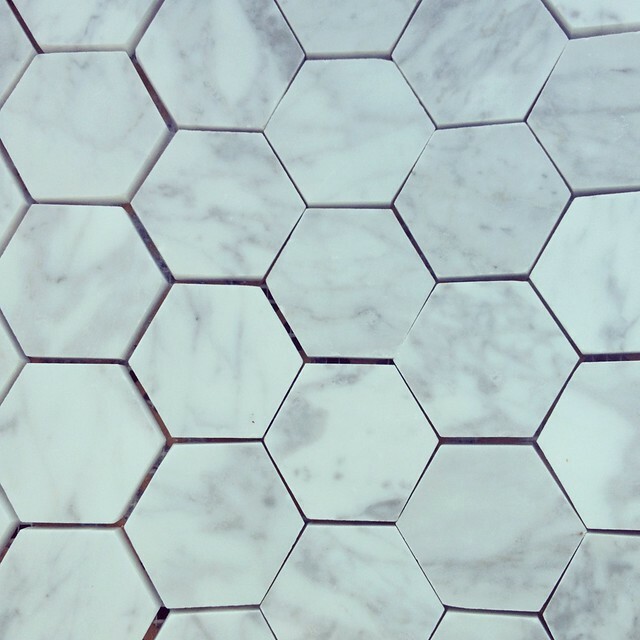 I love the little hex tiles too. And hiring a tiler sounds admirably efficient. You just need a FF button now. I love retro tile,too. We did (I mean had someone do) our master bath floor with that same retro tile (but we did the honeycomb mix of black and white) on the floor and the subway time (with a black border) in the master shower. We love it. I tell remind myself of that again and again because we need to pay for (we are NOT handy) someone to do our kitchen next year and I need to remember that all the dust and crap is worth it because it comes out exactly how you want it!! So remember that! As someone catching up on your blog having just returned from a two week trip to Bali and having put a new marriage through a DIY kitchen renovation not so long ago, I say good call on the professional tiler! Dinner at Bar La Grassa, drinks at Barrio. Eat lunch from a food truck. Get outside: stone arch bridge or Minnehaha falls. Enjoy our beautiful city!